Michael. When Tommy came over to the car where Michael and Martha were listening to music with Jeffrey [Geoffrey] Byrne and Helen Ix, and started chatting Martha up, there can be no doubt Michael was upset. Imagine, then, how he felt when Martha and Tommy started rolling around at the side of the house--in front of everyone. Tommy must have realized such behavior would upset Michael. Perhaps this was part of his motivation? This is a point upon which he must be questioned. It is important to get Tommy talking about his motivations and state of mind during these events. If he is only being questioned on abstract, matter-of-fact details, it will be too easy to distance himself emotionally and intellectually from the truth. He should be thoroughly questioned about his feelings for Martha at the time and his motivation for wanting to be with her sexually. Was he motivated by a desire to infuriate his brother? Was he motivated by a conviction or suspicion that Martha was easy? Was he just looking for momentary gratification? Did he have a genuine affection for her? Remember, Tommy has never spoken truthfully about his feelings and attitudes toward Martha, or exactly what sort of understanding or communication there was between them before she was murdered. This is a glaring omission--one which is highly suspect. 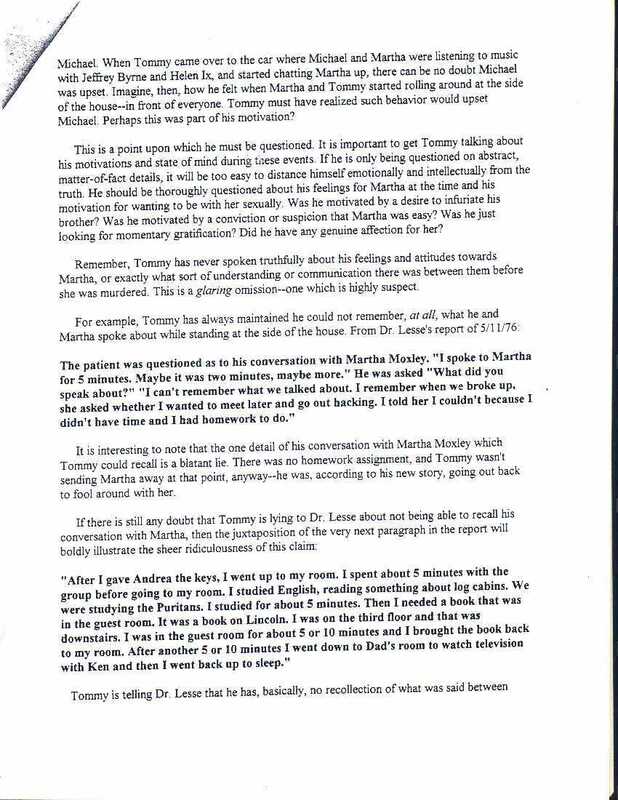 It is interesting to note that the one detail of his conversation with Martha Moxley which Tommy could recall is a blatant lie. There was no homework assignment, and Tommy wasn't sending Martha away at that point, anyway--he was, according to his new story, going out back to fool around with her. "After I gave Andrea the keys, I went up to my room. I spent about 5 minutes with the group before going to my room. I studied English, reading something about log cabins. We were studying the Puritans. I studied for about 5 minutes. Then I needed a book that was in the guest room. It was a book on Lincoln. I was on the third floor and that was downstairs. I was in the guest room for about 5 or 10 minutes and I brought the book back to my room. After another 5 or 10 minutes I went down to Dad's room to watch television with Ken and then I went back up to sleep."